Yesterday, while perusing Pinterest this cover popped out and screamed READ ME! 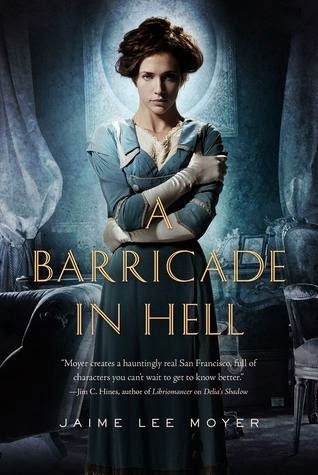 First the title, A Barricade in Hell, got me simply because it sounds like something I would want to know more about (bravo). Some kind of battle against evil - check. Then the cover, just YES. At first glance I thought she was in a straitjacket in an asylum - the white gloves, the way she is holding herself, and the blue background. Then as I looked closer, it gave me a little "Yellow Wallpaper" feel with wondering if the prison is in her own mind. I dig this cover. I want to read this book. Of course, it comes out June 2014, so I have a bit of a wait. 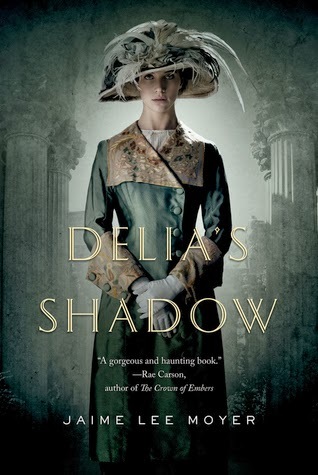 I will read Delia's Shadow before Halloween. Want to know more? Here is the blurb: "It is the dawn of a new century in San Francisco and Delia Martin is a wealthy young woman whose life appears ideal. But a dark secret colors her life, for Delia’s most loyal companions are ghosts, as she has been gifted (or some would say cursed) with an ability to peer across to the other side. And who is now aware of Delia’s existence." Ghosts, murder and the fantastic San Francisco as a backdrop, this book is perfect for October.